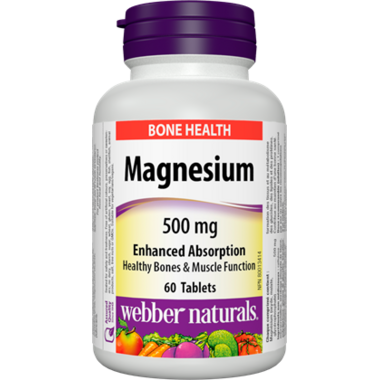 Magnesium Easy Absorption from webber naturals helps in the development and maintenance of bones and teeth. Ideal for those who have low stomach acid or difficulty with absorption, this supplement helps the body metabolize carbohydrates, proteins, and fats. Magnesium helps in tissue formation and in proper muscle function. Non-medicinal ingredients: Microcrystalline cellulose, coating (carbohydrate gum, polyethylene glycol, titanium dioxide, polydextrose, triacentin), croscarmellose sodium, vegetable grade magnesium stearate (lubricant). It might be in my head but I swear I sleep better when I take this before bed. I use magnesium to help with cramps at night. It has been very effective. I notice when I skip a dosage. Well priced product. I normally take one a day. If I miss taking it for more than a few days, cravings increase and sleep is more disrupted. Just started to use it on recommendation to help with my trigger finger. It is already a lot better. Excellent product in a large dosage not easily found in local stores. The price is good too. Great product, keeps me healthy! Been using it for years. I purchased this for night time leg cramps before researching Magnesium, the chelated or glycinate forms are much better without the laxitive effect. Excellent quality and excellent price! Thank you! great price and quality. this brand never disappoints.